This lesson is designed to assist teachers in interpreting and using primary source material with 11th grade students learning about issues including race relations, civil rights, labor, urban, and transportation history, Philadelphia and Pennsylvania history, and World War II. 8.2.12.B: Evaluate the impact of historical documents, artifacts, and places in Pennsylvania which are critical to U.S. history and the world. 8.1.12.B: Evaluate the interpretation of historical events and sources, considering the use of fact versus opinion, multiple perspectives, and cause and effect relationships. In a series of consecutive objectives, beginning with introductory learning items and ending with complex learning items, students will learn specific happenings and surrounding concepts regarding the PTC Strike of 1944. Students will be able to: Identify the key participants in the strike. Students will be able to: Defend the position of the strikers, the anti-strikers, or the government during the strike. Students will be able to: Compare and contrast the differing perspectives that caused the strike. Students will be able to: Support with evidence claims they have previously made about the strike. The teacher can assess whether the desired outcomes have been achieved by continuously assessing the students as they delve into the lesson. The teacher will utilize primary sources to give students the opportunity to view the PTC Strike in the context of the time that the strike occurred. The teacher will ask students to read all or a portion of the Smith-Connally Act (the War Labor Disputes Act), so the students can understand why the federal government got involved with labor issues in Philadelphia during WWII. Read aloud the key parts of the act. Circulate newspaper articles from Philadelphia during the PTC Strike so that the students can get a local perspective regarding the sentiment people had for the strike. It is in these documents/sources that the students can discover the issues and important figures involved in the PTC strike. As the lesson moves forward, students will choose a side to defend, whether it is the strikers, business owners, Philadelphia workers, the transit company, the union, or the federal government. The students will use the evidence they have read and compiled to make an educated decision. Students will compile information from their readings and turn in an essay expressing one of the sides in strike. By the end of this lesson, students should understand the issues surrounding the PTC Strike of 1944 and where it fits in the larger context of the war, and an understanding that it’s important to learn about all sides of a story before judging historical and current events. Prior to this lesson, students should be versed in the skills of critical and analytical thinking. The PTC Strike is complex, dealing with the actions of labor, the reactions of the community and the government, and also involves issues regarding race, economics, local, national, and world events. Teachers should use this lesson as a connecting tool between local and world history. The teacher can use Backwards Design, using a local issue to teach about a larger one. Backwards Design is essential because it allows the teacher to develop goals for assessment first and create the lesson that will follow. The teacher will introduce the students to the PTC Strike by showing them a few [photographs] and asking them to think about them and record their thoughts. 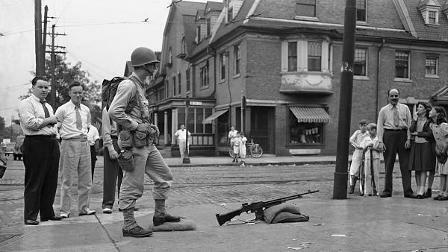 An American Soldier standing in the middle of a Philadelphia Street with a loaded gun. The eight African-American men who were hired by the PTC and their supervisor. African-Americans marching in response to the strike. The military following a trolley car. This photo–sharing will allow the students to view the city of Philadelphia as it appeared in 1944 and also provide the visual learners with something they can easily comprehend. The photos represent the results of decisions and actions made by the participants. The photos should provoke discussion and provide context moving forward. Individually or in teams, students will review the [content] and select which aspect of the strike to examine and subsequently which aspect of the strike they wish to defend by using evidence to support their claims. Students will choose a side of the strike to research: the strikers, the anti-strikers, the government, etc. In 10 minutes, the students will do research about what they have selected and record all that they find. The teacher will then ask students to find someone who chose a different side than they did and discuss how they found items that supported the aspect that they chose. The teacher will then inform the students that they must come up with 2 to 3 reasons, using evidence, why the aspect they chose to examine is a better choice to defend then the others, and if they cannot then they must switch sides. After the bulk activity, that the teacher will give the students the essay assignment to use the information they have compiled to write a 1 to 2 page essay on the effect the strike had on Philadelphia, the nation, and WWII as it pertains to race, economics, or power. The students can write their paper as an active member of those who struck, those who were against the strike, or as a member of the armed forces observing the strike from an outside perspective. The teacher will then explain the importance of understanding the differing arguments. The students will have to use these differing arguments to strengthen their own opinion, all the while using the sources that are available to them.